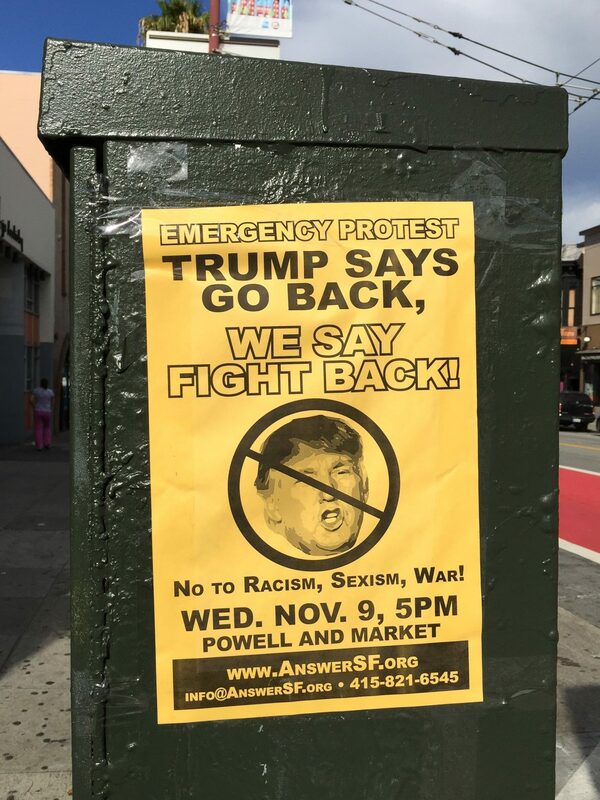 Anti-Trump Protest Announcement, San Francisco Photo by Frank Schulenburg. This story was originally posted on January 3, 2017. There was a swift outcry about some of Trump’s speech. Countless critics condemned Trump for using the tragic events in Orlando to attack President Barack Obama, brag about his apocalyptic predictions of America’s decline, exaggerate his sympathies with LGBTQ people, and vilify Muslims abroad and at home. While Trump demanded the prohibition of immigration “from areas of the world where there’s a proven history of terrorism against the United States, Europe or our allies,” they pointed out that the shooter was a U.S. citizen with no known links to terrorist organizations, that the expansion of his proposed “Muslim ban” was not just unprecedented and bigoted but also irrelevant. Still, there was widespread agreement with Trump on one point: Orlando was “the worst mass shooting in our country’s history.” News outlets trotted out variations of that phrase then and have repeated it since. The phrasing is instinctive. Habitual. Americans under the age of thirty have heard variations of it deployed on too many occasions. Virginia Tech. Sandy Hook. Aurora. Columbine. These are household names. They are a part of our vocabulary. In that sense, Orlando was horrific but it was not incomprehensible. And journalists have been quick to remind us of that. “We have the language to quantify this carnage,” they insist. The deaths of dozens of victims, the physical and emotional injuries of dozens an even greater number of survivors; those added up to the latest but probably not the last deadliest or “worst mass shooting” in United States history. Put simply, in the case of Orlando, the “worst mass shooting in our country’s history” is a trope that despite its bombast silences much, much more than it reveals. Some of this silencing was exposed in the weeks following the shooting. As Trump, who would soon win a presidential endorsement from the Ku Klux Klan, promised that he and he alone could “protect the American people,” historian Ariella Gross pointed out that to call the massacre at Pulse ““the deadliest mass shooting in American history” . . . is to forget the last hundred years of U.S. history of mass violence fueled by racial hatred and homophobia.” She is right. Mass shootings of Black people were common from the end of the Civil War through World War II. They shaped the demographics of Ocoee, Florida. During the election season of November 1920, carloads of Klansmen descended on the small town located just thirteen miles west of Orlando. They seized a prosperous Black farmer named Julius Perry from a local jail, dragged him behind a car, and then hanged him from a telephone pole. After riddling his hanging body with bullets, the perpetrators left a note that revealed their victim’s crime: “this is what we do to niggers who try to vote.” True to their word, the terrorists then turned their attention to the Black residential district of Ocoee. They burned it down, shooting Black men, women, and children fleeing the flames. At least one victim was castrated. In the end, more than fifty African Americans died and, fearing similar fates, all the survivors abandoned the town. Ocoee became all-White and would remain so until the 1980s. From his perspective, shooting individual Haitians was fun. Habitual. To his peers, mass shootings of Haitians were even greater sport. In December 1929, U.S. Marines posted in the coastal city of Les Cayes fired machine guns into a crowd of Haitian protestors. In one sense, the murder of dozens of Haitians became an international embarrassment that drew more demands for the restoration of Haitian independence. In another, the Les Cayes massacre presaged the Haitian future. Long after the U.S. Marines returned home, the Haitian state would continue to stifle democratic expression with the mechanisms of mass violence and militarism that the United States introduced during the occupation. It was these intertwined histories of mass shootings, masculinity, racism, and militarism that collided in the early morning of June 12, 2016. They mattered the minute that a gunman armed with an assault rifle designed for U.S. Special Operations forces and employed by G4S, a global security form used by the West to police the Global South, walked into Pulse nightclub. The ensuing massacre occurred on Latin Night, a night when most of the patrons at Pulse were people of color from communities most affected by the routine mass violence of the twentieth century United States. There were Black victims from Chicago and Philadelphia, two cities that became destinations for Black southerners fleeing the violence of Jim Crow during the Great Migration. There were also Haitian-American victims whose families joined the Haitian Diaspora in Florida after occupation, dictatorship, and, yes, the failed interventions, development initiatives, and humanitarian aid projects of Bill and Hillary Clinton, devastated their homeland. Alongside them, were dozens of dead and wounded people from the Dominican Republic and Puerto Rico. The latter fought off U.S. occupation during the 1920s; the former remains a U.S. colony more than a century after its invasion by U.S. troops under the leadership of an officer who was also implicated in the massacre of more than three-hundred Sioux at Wounded Knee. Of course, the people who lost their lives or survived the violence at Pulse were more than people of color. It matters a great deal that they identified as queer people of color who were celebrating Pride month. For writer Miriam Zoila Pérez, “being queer and Latinx in the U.S. sometimes feels like it can be impossible to find our people.” Pulse was one place where they could. In the midst of anti-LGBTQ legislation sweeping the U.S. South and in a year when Donald Trump constructed a new “southern strategy,” selected a running mate who advocated for “conversion therapy,” and rode a wave of anti-immigration rhetoric to political prominence, that club in Orlando was a place where that hatred did not matter. But then, suddenly, it did. The massacre at Pulse reinforced the fact that, according to the National Coalition of Anti-Violence Programs, people of color make up approximately eighty percent of the LGBTQ people killed in the United States. For all the efforts to link the violence in Orlando to other attacks on the gay community in the United States, this was something different. It was a shooting that reinforced the ways in which mass violence is neither random nor unpredictable. It demonstrated what we should already know: that homophobia and racism are interrelated forces that weigh heaviest upon people who do not have the privileges of Whiteness or the securities of cisgender heterosexuality. To understand Orlando is thus to understand Ocoee and Les Cayes. To empathize with its victims requires an appreciation of the intersections of race, gender identity, and sexuality. To denounce this mass shooting is to repudiate a toxic culture of masculine violence that had and continues to have a pronounced and related effect on shaping the U.S. and Global South. Perhaps the greatest shortcoming of defining Orlando only as the “worst mass shooting in our country’s history” is that it renders its victims and their communities silent, replicating in death the same marginality they resisted in life. Orlando was not Sandy Hook. Or Aurora. Or Columbine. It did not cohere with what Grant Duwe, a prominent researcher of mass murder in the United States, has dubiously described as the tendency of “modern” mass killings to involve violence perpetrated by the “have nots” against the “haves.” And nobody has made that clearer than the queer people of color who spoke out in the wake of this tragedy. Since the Orlando shooting, queer artists, activists, and writers who identify as Latinx, Black, or both have announced that a mass shooting of their brothers and sisters, hermanos y hermanas, will not silence their voices. Their articles and interviews have sometimes denounced but just as often ignored colorblind acts of national mourning or efforts to use Orlando to reinforce narratives about gun control and terrorism. Indeed, other narratives have taken precedence among queer people of color. In the wake of tragedy, their writings have conveyed what space and place—Latin Night at a gay club in the deep South, for instance—mean to them as sites of liberation. They have articulated how people from outside their communities can practice good allyship and build solidarities with those most affected by the shooting. In that sense, Orlando belongs just as much to a powerful tradition of subaltern resistance as it does to a long history of routine mass violence. The Ocoee massacre did not stop strivings for Black self-determination in Florida—that is proven by the continued survival of Eatonville, the all-Black town that nurtured Zora Neale Hurston. The Les Cayes massacre could not thwart the drive for Haitian self-government—less than five years later, Haitian political leaders were able to declare their country’s “Second Independence.” The Orlando massacre clearly did not have its intended effect, either. Less than two weeks after the shooting, hundreds of people gathered for a Latin street party hosted by the owner of Pulse. There was salsa and reggaeton, boisterous singing and dancing. There was community and love and joy in the face of violence meant to destroy all three. Five months he used the “worst mass shooting in our country’s history” to describe the events at Pulse and reinforce his xenophobia, Donald Trump was declared the next president of the United States. Since then, demonstrations have erupted in Charlotte and Dallas, Atlanta and New Orleans. They have exploded in Gainesville and Tampa, Florida. Protestors there, throughout the South, and across the rest of the United States have distanced themselves from Trump, declaring that they owe no respect, let alone allegiance, to a man who led the “birther” movement against President Barack Obama, promised to build a wall along the U.S. border to keep Mexican “rapists” in their own country, demanded the complete ban on Muslim immigration to the United States, and boasted about sexual assault on the campaign trail. Indeed, their opposition has strengthened rather than diminished in light of the rash of hate crimes and threats perpetrated in the name of the president elect. What comes next? That depends. Orlando provides real lessons about the causes, consequences, and targets of U.S. violence. It also offers meaningful ideas about resistance to marginalization and oppression. Accessing both—making those lessons and ideas useful—will take work, though. It will take full understanding of an event that was not the “worst mass shooting in our country’s history” but a product of that very history, an event that is a haunting reminder of our country’s failures and, without work, a searing portent of its future. If they come and shoot at us, we're gonna protect ourselves like a lawful citizen would do and shoot back. And that's just common sense. No one is immune to the bullets sprayed or the cars driven in the intense, seething rage of white supremacist anger at its peak. No one is safe. When white supremacy prevails, we all suffer.